At the end of 1919 the developers of Hacienda Park scored a major coup. As a capper after 14 successful years selling lots in their new high-end neighborhood along Sunset Boulevard in what is today West Hollywood, they could finally announce that two of the biggest stars in Hollywood had purchased prime lots side-by-side in the neighborhood. The two stars were Wallace Reid, one of the most popular leading men of the day, and William S. Hart, a classically trained theatrical actor who’d become the first great motion-picture cowboy star. Both stars were under contract with Famous Players-Lasky, the precursor to Paramount Pictures and the biggest and most successful studio in the world in that era. But the fact that they’d bought the neighboring lots on De Longpre Avenue at around the same time was strictly a coincidence. The two men had little or nothing in common and were not friends. Wally Reid was 29 years old, married, liked to party and was known as a “Good Time Wally” in certain circles. Bill Hart was 56, unmarried and a bit of prig. Wally was known professionally as a quintessential all-American who could play action roles as well as romantic leads. Because of his success at the box office the press had dubbed him the “King of Paramount.” His wife, Dorothy Davenport, was a former juvenile star who’d retired from acting full time when they married. The couple had shared similar upbringings. Both were raised in well-known theatrical families and had spent much of their childhood years on tour. In his youth Wally worked with Buffalo Bill Cody. Dorothy got her start in film acting for D.W. Griffith. After a stint in military school during his teen years, Wally returned to the stage with his parents. He developed an interest in writing and directing, which he came to prefer over acting. He made his first film in Chicago in 1910 and then soon moved to Hollywood. Dorothy was a 17 year-old starlet at Universal when she met Wally, by then a 22 year-old assistant director who also worked as an actor. 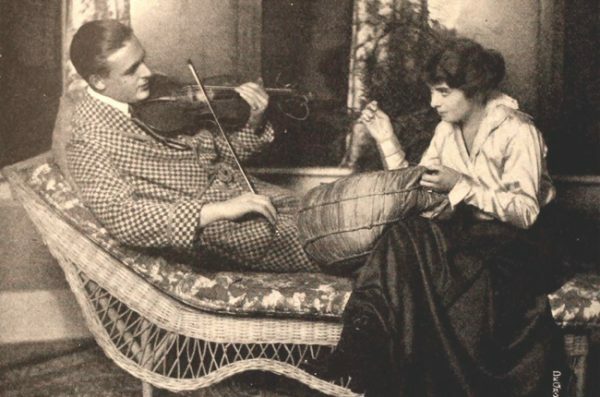 They were married on October 13, 1913. They soon had a son named Billy and adopted a daughter named Betty. Wally’s career went into overdrive in 1915 after he was cast in D.W. Griffith’s “The Birth of a Nation,” a scandalously positive depiction of the rise of the Ku Klux Klan and one of the first box-office megahits. Although he had appeared in 120 films, mostly one-reelers, by then, it was a small role in this big hit — he played a blacksmith shown at work at his forge, shirtless and glistening — that made him a star. Wally soon became Paramount’s top player, earning $156,000 a year, which is about $4 million today. After a long career in the late 1800s as a journeyman actor, Bill Hart had appeared in dozens of films, usually in the lead role, by the time he signed with Famous Players-Lasky in 1917. He often appeared with his horse Fritz, establishing the model for popular cowboy-and-horse duos to come: Tom Mix and Tony, the Lone Ranger and Silver and Roy Rogers and Trigger. The houses on DeLongpre occupied by the two stars were as different from each other as their owners were. Hart’s house was one of three similarly designed, classic New England-style shingle-sided homes in a row on the street, likely built on spec by the developers. The siting of the houses into the slope above De Longpre and below grade on Sunset Boulevard left the backyards visible from the busy street above, making the intersection of Sweetzer Avenue and Sunset a popular stop on tours of movie stars’ homes. 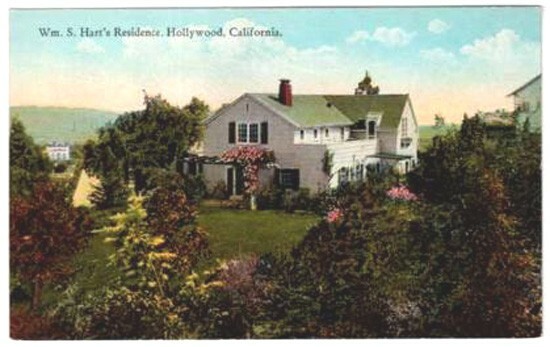 Rear views of each home were featured on “picture postcards” of the movie stars home that were popular souvenirs of trips to Hollywood. Wallace Reid couldn’t have known it at the time, but by the time he and his family moved into their new home in 1920 the seeds of his destruction had been sewn. Just a year and a half earlier he had suffered a head injury while filming “The Valley of the Giants” in Oregon. A physician on the set administered morphine so that he could keep filming. The treatment continued for a while when he returned to Hollywood, but when his access to drugs was cut off, Wally found a ready supply from drug dealers in the lucrative black market that serviced actors and other studio employees. Wally also began drinking heavily and hosted wild, all-night parties at his new house in Hacienda Park. At first, he hid his addiction from Dorothy, but she found out in 1921. By then he was in the throes of full-blown addiction. She watched helplessly as the abuse took its toll, first on his career and then on his health. In the fall of 1922 Wally and Dorothy left the children with her mother and went to a retreat in the mountains. Removed from the temptations of drugs and whisky, Wally spent time hiking and exercising. Eventually his cravings subsided, and the couple returned to their home in Hacienda Park confident that he’d beaten his addiction. Within a week after leaving the mountain retreat, however, Wally became ill. His condition deteriorated over the next few weeks, and he was admitted to a hospital, where he was diagnosed with influenza – an especially deadly disease then. Just four years earlier 50 million people worldwide had died in the Spanish flu pandemic. On Dec. 12, he was moved to the Banksia Sanitarium in Hollywood where he was treated for flu and nervous exhaustion. His condition never really stabilized. On Dec. 16, Dorothy decided to go public. She and her mother gave an exclusive interview to the Los Angeles Times at the Reids’ home in Hacienda Park. But he did not come back, unfortunately. He was dead within weeks. In those days drug addiction was viewed not as a medical issue but as a moral failure. Families affected by it usually kept it secret. While millions of Wally’s fans were saddened and concerned during the weeks before he died, as often happens when tragedies affect famous people, because his death spiral was drug-related, it was viewed as a scandal among the nation’s self-appointed moral arbiters. 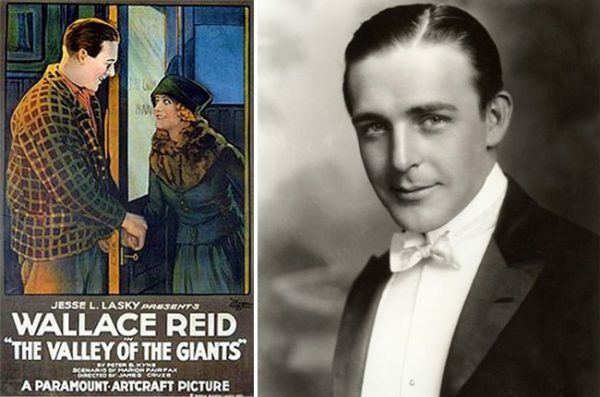 As his studio’s biggest earner, the scandal around Wallace Reid’s addiction was a huge problem for his bosses – but it wasn’t the first. Starting in 1920 a series of scandals had embroiled some of the biggest names in the business, all of whom worked for Famous Players-Lasky. In September 1920 Olive Thomas, one of the screen beauties of the era, died in Paris after ingesting a mixture of water and mercury bichloride, a highly toxic substance used as a bathroom cleaner. Although not a major star, Olive was still considered Hollywood royalty due to her marriage to Jack Pickford, a dashing young actor whose sister, Mary Pickford, was “America’s Sweetheart,” and the reigning queen of Hollywood. The cause of death was acute nephritis. But there was speculation then – as there still is – that Olive had committed suicide, or that she’d taken the wrong draught because she was drunk and high on cocaine and other drugs. Almost exactly a year later, in September 1921, Roscoe “Fatty” Arbuckle, one of the most popular comedy stars of the day, was charged with manslaughter in the death of a young actress, Virginia Rappe, who died after falling ill at a party Arbuckle hosted at San Francisco. The cause of death was a ruptured bladder and peritonitis. Nonetheless, a completely baseless rumor spread that Arbuckle punctured Rappe’s bladder with a champagne bottle – a myth that persists to this day. In what may have been the first-ever circus-like celebrity murder trial, the Arbuckle case was tried three separate times. The juries hung in the first two, but on April 13, 1922, the third panel returned with a twelve-zero verdict for acquittal. That jury even issued an apology that began, “Acquittal is not enough for Roscoe Arbuckle.” And it wasn’t enough. The scandal killed Arbuckle’s acting career. Scandal struck again less than six months later, in February 1922, when film director William Desmond Taylor was shot dead in his home on Alvarado Street in the then-fashionable Westlake Park district. Among the suspects were teen star Mary Miles Minter — who’d had an unreciprocated crush on Taylor, 20 years her senior — Minter’s mother, Charlotte Selby, and actress Mabel Normand, who’d made a series of hit pictures with Roscoe Arbuckle. 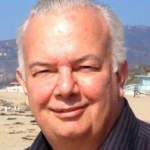 The case was unsolved for more than 90 years – until 2015 when in his book,“Tinseltown,” author William Mann identified the likely killer as a member of an extortion ring that had been targeting Taylor, a man with many secrets, including the facts that his real name was William Deane-Tanner, that decades earlier he had abandoned his wife and children and disappeared from their lives – and that he was gay. And then just 10 months after Taylor’s murder, Dorothy Reid went public with the truth about Wally’s condition. On January 18, 1923, she was holding him in her arms at the sanitarium when he took his final breath. Dorothy and the children continued to live in the house in Hacienda Park for six years after Wally died. After they moved out, Dorothy put the house up for lease. On Feb. 1, 1930 she bought Casa de Contenta, a luxury apartment building at 1534 N. Hayworth Ave., five blocks east of her former home. It featured a lounge, a tea garden, putting green, 16 by 50 foot swimming pool, gymnasium and cafe. One famous tenant was Roscoe Arbuckle, who was by then working occasionally as a film director. 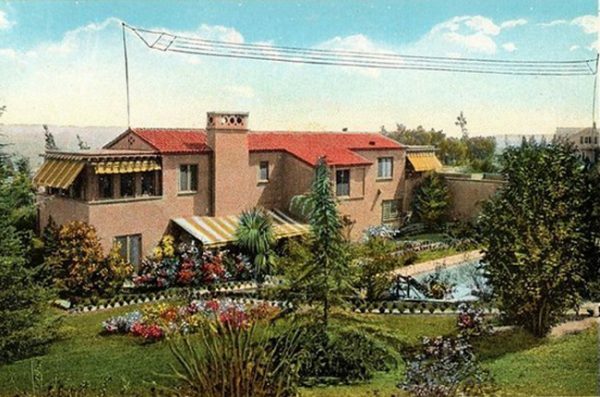 Meanwhile, Dorothy was duped into leasing the Hacienda Park house to a Sunset Strip gambler named Homer “Slim” Gordon — his wife had arranged the lease, claiming to be the wife of an Oklahoma oilman. The Gordons converted the house into a casino, with roulette wheels, dice and card tables. In 1961, the Reids’ former home was demolished and replaced by the Strip’s first “motor hotel,” the Thunderbird Inn, which is now the Standard Hotel. Dorothy Davenport – Mrs. Wallace Reid – died in 1977. She was 82. In 1927 the two houses west of Bill Hart’s home on De Longpre were demolished to make way for the Sunset Tower Apartments. Hart began spending most of his time at his ranch in Santa Clarita. In 1944 he donated the De Longpre property to city of Los Angeles – he may have been unaware that the lot was in county territory. He died two years later, at age 81. Today his former home is a park operated by the city of West Hollywood. Both Bill Hart and Wally Reid are mostly forgotten today. If Wally is remembered at all it’s for his drug-related death and its place in the cluster of silent-era scandals. Wally’s could be said to have presaged the drug-related deaths of two other popular actors. Both occurred decades later but each one died on the Sunset Strip, not far from the site of the Reids’ home in Hacienda Park. John Belushi ODed in a bungalow behind the Chateau Marmont in March 1982, and River Phoenix died from an overdose at Cedars-Sinai Medical Center after collapsing on a sidewalk outside the Viper Room, on Halloween night 1993. The Reids’ story may have inspired a moment in both the 1937 and 1954 versions of “A Star Is Born.” In the movie Norman Maine is a big star whose alcoholism destroys his career at the same time that his ingénue wife, Vickie Lester, is on the path to stardom. Despair eventually gets the better of Norman and he commits suicide. At the end of the film the screenwriters invoke Dorothy Davenport’s steadfast loyalty to her husband when, in a dramatic moment, Vickie introduces herself to a broadcast audience, saying, “This is Mrs. Norman Maine”– just as Dorothy proudly called herself “Mrs. Wallace Reid” for 51 years after Wally had died in her arms. Very interesting read and much appreciated.